If you’re involved in any type of design that includes residential, healthcare or hospitality where water is used, you need a sink. In fact, sinks are so common we might minimize how much they can impact a good design. For the most part, the options you have in selecting a sink depends largely on what sink manufacturers produce. The advantage of a solid surface sink is that you can design a sink that fits your approach to design. 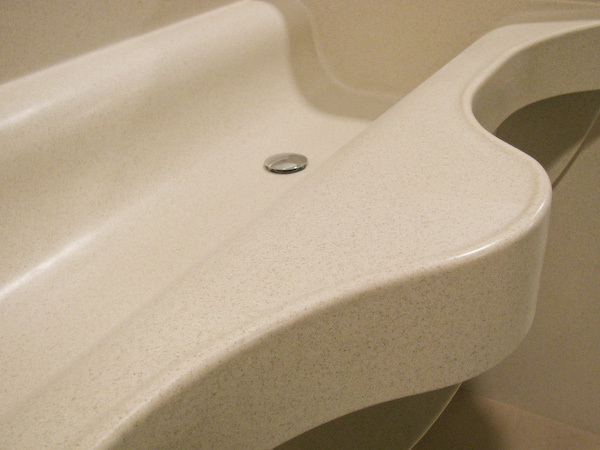 Solid surface fabrication techniques that include thermoforming, mold making, and CNC technology make it possible and affordable to design and fabricate sinks that fit your needs. Let’s examine a few of these thoughts in more detail. As hospitals declare war on germs, solid surface has played a key role because of its non-porous surface. Surgical rooms need large scrub sinks to wash before surgery. One solution has been to design and fabricate surgeon scrub sinks out of solid surface which allows them to be engineered and fabricated in a practical way. Notice the surgeon scrub sink you see in the picture. It has removable panels to allow maintenance crews access if work needs to be done. Put the panel back on and you have a workable and design pleasing sink. Hotels have many rooms and because of the volume of sinks needed, the rooms tend to be generic. There frankly aren’t many options. But, a well thought, original design can make for a great look. 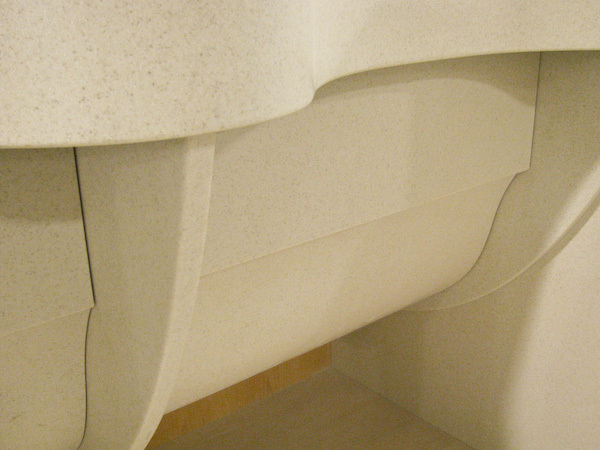 Solid surface sinks give designer’s un-limited design possibilities. When a homeowner remodels their kitchen they want it to stand out. Having a one of a kind kitchen is very pleasing. A custom solid surface sink can be that final touch in a beautiful kitchen. There are so many design ideas. How about a farmers sink? What about a sink that fits your needs as a cook? 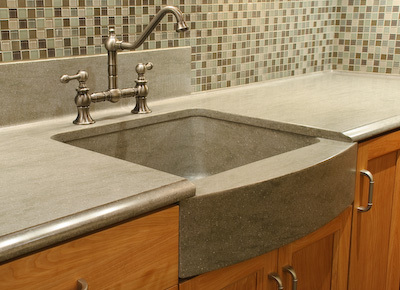 Solid surface sinks can also be mounted to other surfaces such as granite and concrete tops. There is one point that needs to be cleared up concerning solid surface sinks. Many people feel they look dirty or scratch easy. This is simply not true. The dirt and scratches you see can be caused by two things. Your sink wasn’t sanded properly before it was installed or proper maintenance hasn’t been performed. Make sure your fabricator doesn’t minimize the importance of a good sanding job. A good rule of thumb is whatever sanding procedure was used to sand your top should be applied to the sink as well. For maintenance instructions do as your home care kit suggests. Make a solid decision, think about a solid surface sink!